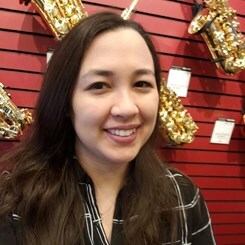 I started my musical career when I picked up the saxophone at Stevenson Middle School, though I had always loved playing the ukulele and singing along during family jam sessions. At John Jay High School, I was active in the jazz band, UIL state ensemble contest, and was drum major both my junior and senior years. In college I continued to play and was part of the inaugural UTSA Spirit of San Antonio marching band. The best part of my job is seeing how excited new musicians are to begin their journey. If there’s anything I can do to help you out, please let me know!